Today's post is short and sweet, but I hope you have as much fun reading it as I did writing it! 1. Thou shalt always promote others ahead of thyself. 2. Thou shalt not have a running self-promotion and/or commercial for thy newsfeed. 3. Thou shalt add substance and value—not trivia or irritation—to those who like and follow thee. 4. Thou shalt not hog the stream of any social media network thou are a part of. 5. Thou shalt interact with those who comment upon and share thy updates. 6. Thou shalt not share thy location or the fact that thou is on vacation. 7. Thou shalt take time to edit thyself before posting (auto correct is not thy friend). 8. Thou shalt not plague others with auto responders when someone new follows thee. 9. Thou shalt ALWAYS use a recognizable headshot as thy avatar. 10. Thou shalt not add others to groups without permission. What commandment would you add to the list? I could think of several others but I was trying to stick with my theme! Be sure to share your thoughts in the comments section below. Thou shalt always be considerate of others' time whilst they seek to help you. Love 'em. I can see you now Ms. Edie, descending with two stone tablets, one strand of hair across your forehead, a look of determination on your face. Yes ma'am... whatever you say. God's blessings for this morning's smile. Boy, are you right about autocorrect! Sometimes, it even changes things as you hit send, even though you edited it! Number 8 is the one I find more irritating. Those auto responders make me want to unfollow people. I would add "Thou shall not use more than 3 hastags." Thou shalt clear thy cache so thou can read other's blogs. 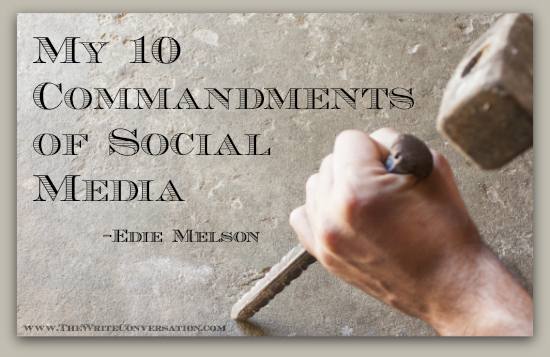 :) Great post, Edie! This would be a great thing to print and hang on the wall next to the computer! My headshots are getting very old! I'm still recognizable, but....lol! God bless you, Miss Edie Moses, I mean Melson...you are the best! Thanks for sharing such great support. Thou shalt pray before posting any message.